Some of you are also following my FB page NailPolishTherapy and saw that I posted a picture of the new Revlon color Sparkle Aplenty recently displayed at Walgreens. I was so excited to finally get it after stalking 4 different drugstores :). Yes I did stalk the stores and at the fifth Walgreens by my job I finally snagged the beauty! So needless to say I was over the moon. Revlon Sparkles Aplenty is a black jelly based with silver hexes and silver glitter. The jelly base is slightly more opaque than your average jelly but can still be worn as a jelly. With two coats it gives perfect coverage and while casting a wonderful layering effect. Te hexes look like they're suspended in some parts and laying on each other in other parts. 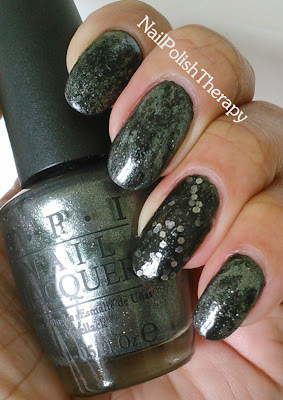 So here is Revlon Sparkle Aplenty beside Sation Black. I have to say that Sation Black is the shiniest, creamiest, jet black I've ever tried and for sure a 1 coater. 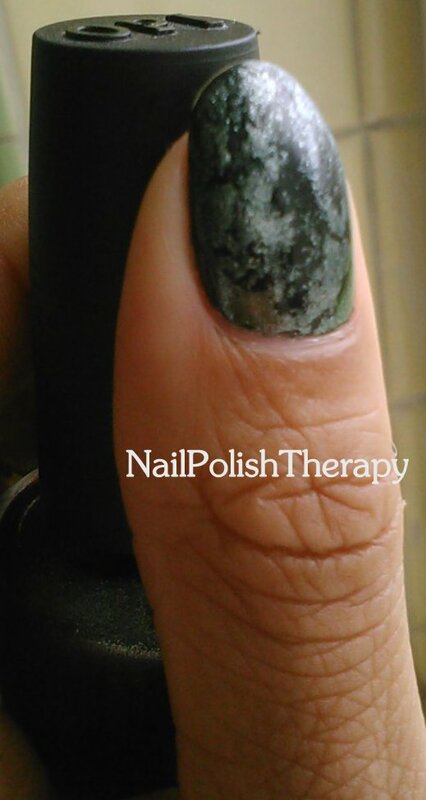 I've heard that Cult Nails Nevermore is a great black but I haven't tried it. This Sation Black cost me $3 at my local nail supply store so I can live with that. Below is a closeup of my thumb with natural light. I don't know if it's the combination of colors I used but this was hard to photograph, hence the reason I only have 2 photos to share. The others were so pix-elated and didn't show the difference in the two colors well. I will be doing this again since it was so easy to do and I have plenty of plastic bags I can put to use. I like the effect. Thoughts? Feelings? Concerns?